Wayne Reynolds is a terrific fantasy artist. The highlights of this artbook are his fantasy characters and action-packed scenes. 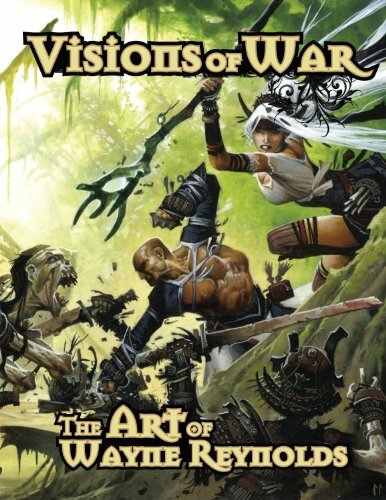 The fantasy art included comes from Warhammer, Reaper Miniatures, World of Warcraft TCG, Magic: The Gathering, Dungeons & Dragons, Pathfinder and other works, including personal ones. The bulk of work are from 2003 onwards. Also included are some yet-to-be-published artworks scheduled for 2014 release. His illustrations and paintings are either printed one per page, or two per page. The book's a 256-page hardcover. So lots of artworks included. The character designs are amazing and there are so many of them. They are elaborate, detailed and look great. Creatures, warriors, spirits, etc, you name them, he has drawn them. The action-packed scenes are quite epic. There's always the element of danger and suspense. You feel like you need to know what happens in the next scene. In that sense, the narrative and storytelling element is very well handled. I think there's a lot to be learned about dynamic composition and staging the scene with characters. The letdown is the low resolution reproduction for many of the accompanying sketches, and some of the coloured artworks. You can really see some of the jaggedness that comes from the low resolution scans, especially for the pencil line sketches. Majority of the coloured pieces are alright but you can spot some that could be reproduced better. This book could be so much better. Another possible downside is the lack of commentary. All the artworks are listed with title, source and year. But there not write-up on the actual work, or even the artist's career except for a one-page introduction by the publisher. I'll still recommend this book because the art is great, reproduction's not the best, but the huge amount of art makes up for it.